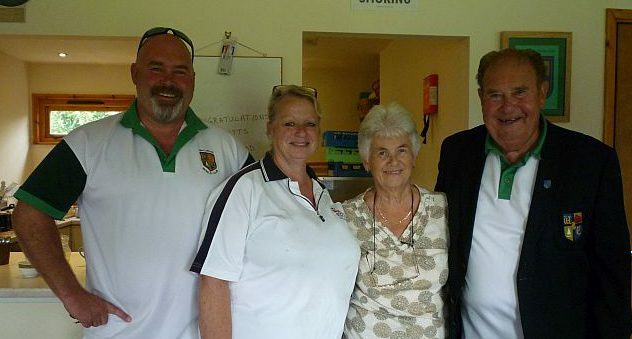 On Thursday September 7th The Friends from nine counties travelled to Oxfordshire to play at Watlington B.C. to help them celebrate 80 glorious years. The weather looked a bit grim but luckily the rain stayed away. Margaret and George were on hand to see to our thirsty needs and Wendy and Gail looked after our appetites. We were greeted on arrival with cups of tea and shortly afterwards the delicious buffet lunch was served. Gail having carefully catered for all us difficult people. Thank you Gail – it was really appreciated. President Bob Gilkes met us all at the door as we arrived and made us very welcome and thanked us all for coming to join in the festivities. 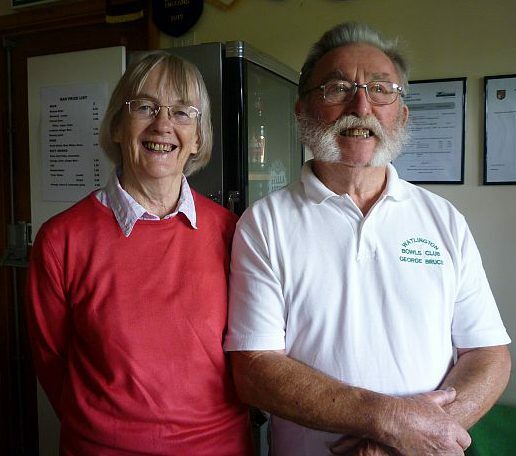 It was wonderful to see Bob and his wife Nina up and about after their horrific car accident and we wish them a speedy recovery and hope to see Bob back on the green shortly. It was also lovely to see all the family pulling together to make this a very happy event. 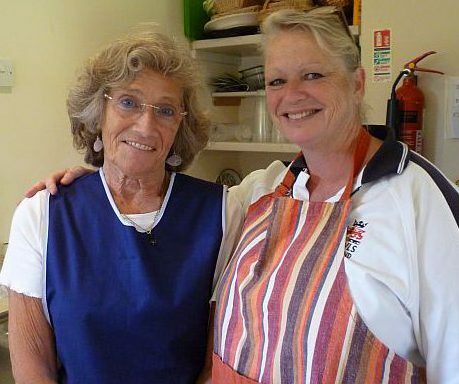 Gail taking over from Nina and doing the catering on this occasion. At 1.20 we left the club and went on to the green where Bob made a welcome speech and then handed the green over to Captain David Byers and Adie to read out the cards. And that is how the afternoon carried on with lots of laughter across the six rinks. It was a close game but unfortunately The Friends lost by 12 shots. Age being no barrier to winning. 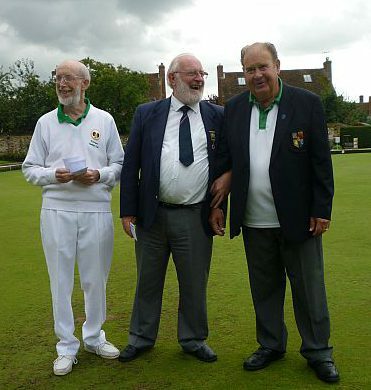 Ron 90, Henry 89 and Gerry 87 being three of the men in the Watlington team. The green played very well so our thanks go to Henry Franklin for doing such a splendid job. Following the game a meal was served in the club house and then Bob gave an amusing speech which had us all laughing. It was Henry’s 89th birthday and we all sang Happy Birthday to him. Playing against him was Neil Fletcher from the friends who was also celebrating a birthday (but not his 89th). Adie then replied and told the gathering a little bit about The Friends and all the fun we have whilst contributing to the sport we all love. Top rink prizes were then given out and then the raffle took place. A bit of a mix up to start as someone had not programmed the machine and it only went up to ten. This became apparent after four goes and then it was rectified amid lots more laughter. 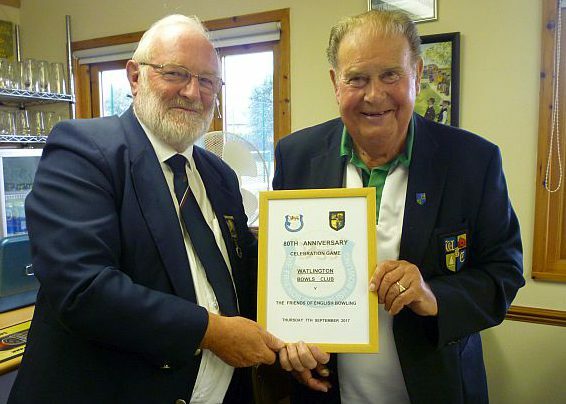 We all had a great time and thoroughly enjoyed our day helping the club celebrate their 80th Anniversary. Thank you once again for inviting us.